Ancona ([aŋˈkoːna]; Greek: Ἀγκών – Ankon (elbow)) is a city and a seaport in the Marche region in central Italy, with a population of around 101,997 as of 2015. Ancona is the capital of the province of Ancona and of the region. The city is located 280 km (170 mi) northeast of Rome, on the Adriatic Sea, between the slopes of the two extremities of the promontory of Monte Conero, Monte Astagno and Monte Guasco. 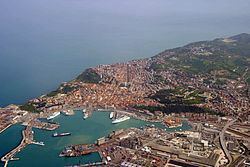 Ancona was founded by Greek settlers from Syracuse in about 387 BC, who gave it its name: Ancona stems from the Greek word Αγκων, meaning "elbow"; the harbour to the east of the town was originally protected only by the promontory on the north, shaped like an elbow. Greek merchants established a Tyrian purple dye factory here. In Roman times it kept its own coinage with the punning device of the bent arm holding a palm branch, and the head of Aphrodite on the reverse, and continued the use of the Greek language. When it became a Roman colony is uncertain. It was occupied as a naval station in the Illyrian War of 178 BC. 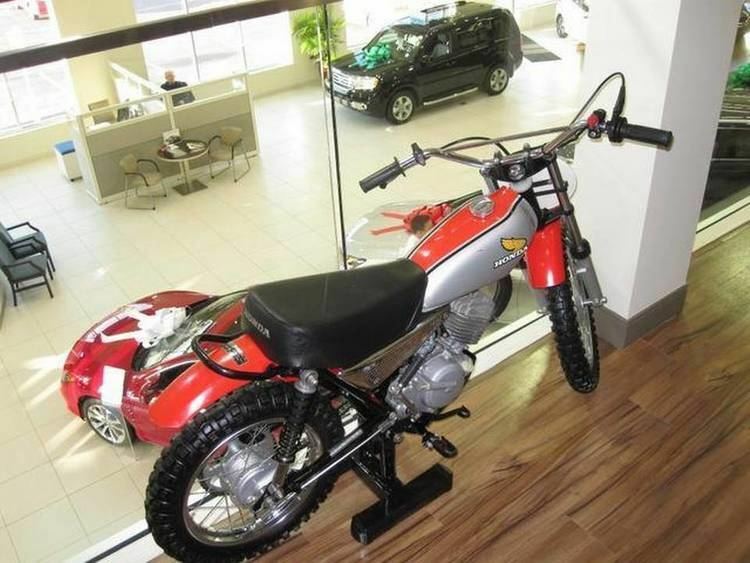 Julius Caesar took possession of it immediately after crossing the Rubicon. Its harbour was of considerable importance in imperial times, as the nearest to Dalmatia, and was enlarged by Trajan, who constructed the north quay with his Syrian architect Apollodorus of Damascus. At the beginning of it stands the marble triumphal arch with a single archway, and without bas-reliefs, erected in his honour in 115 by the Senate and Roman people. Ancona was successively attacked by the Goths, Lombards and Saracens between the 3rd and 5th centuries, but recovered its strength and importance. It was one of the cities of the Pentapolis of the Roman Exarchate of Ravenna in the 7th and 8th centuries. In 840, Saracen raiders sacked and burned the city. After Charlemagne's conquest of northern Italy, it became the capital of the Marca di Ancona, whence the name of the modern region. After 1000, Ancona became increasingly independent, eventually turning into an important maritime republic (together with Gaeta and Ragusa, it is one of those not appearing on the Italian naval flag), often clashing against the nearby power of Venice. An oligarchic republic, Ancona was ruled by six Elders, elected by the three terzieri into which the city was divided: S. Pietro, Porto and Capodimonte. It had a coin of its own, the agontano, and a series of laws known as Statuti del mare e del Terzenale and Statuti della Dogana. Ancona was usually allied with Ragusa and the Byzantine Empire. In 1137, 1167 and 1174 it was strong enough to push back the forces of the Holy Roman Empire. Anconitan ships took part in the Crusades, and their navigators included Cyriac of Ancona. In the struggle between the Popes and the Holy Roman Emperors that troubled Italy from the 12th century onwards, Ancona sided with the Guelphs. Differently from other cities of northern Italy, Ancona never became a seignory. The sole exception was the rule of the Malatesta, who took the city in 1348 taking advantage of the black death and of a fire that had destroyed many of its important buildings. The Malatesta were ousted in 1383. In 1532 it definitively lost its freedom and became part of the Papal States, under Pope Clement VII. Symbol of the papal authority was the massive Citadel. Together with Rome, and Avignon in southern France, Ancona was the sole city in the Papal States in which the Jews were allowed to stay after 1569, living in the ghetto built after 1555. In 1733 Pope Clement XII extended the quay, and an inferior imitation of Trajan's arch was set up; he also erected a Lazaretto at the south end of the harbour, Luigi Vanvitelli being the architect-in-chief. The southern quay was built in 1880, and the harbour was protected by forts on the heights. From 1797 onwards, when the French took it, it frequently appears in history as an important fortress. Ancona entered the Kingdom of Italy when Christophe Léon Louis Juchault de Lamoricière surrendered here on 29 September 1860, eleven days after his defeat at Castelfidardo. On 23 May 1915, Italy entered World War I and joined the Entente Powers; in response the Austro-Hungarian Navy attacked Ancona, causing extensive damage and killing several dozen people. In 1531 the Confraternity of the Greeks (Confraternita dei Greci) was established which included Orthodox and Catholic Greeks. They secured the use of the Church of St. Anna dei Greci and were granted permission to hold services according to the Greek and the Latin rite. The church of St. Anna had existed since the 13th century, initially as "Santa Maria in Porta Cipriana," on ruins of the ancient Greek walls of Ancona. Disputes between the Orthodox and Catholic Greeks of the community were frequent and persisted until 1797 when the city was occupied by France who closed all the religious confraternities and confiscated the archive of the Greek community. The church of St. Anna dei Greci was re-opened to services in 1822. In 1835, in the absence of a Greek community in Ancona, it passed to the Latin Church. Jews began to live in Ancona in 967 A.D. In 1270, Jewish resident of Ancona, Jacob of Ancona travelled to China, four years before Marco Polo and documented his impressions in a book called "The City of Lights". From 1300 and on, the Jewish community of Ancona grew steadily, most due to the city importance and it being a center of trade with the Levant. In that year, Jewish poet Immanuel the Roman tried to lower high taxation taken from the Jewish community of the city. Over the next 200 years, Jews from Germany, Spain, Sicily and Portugal immigrated to Ancona, due to persecutions in their homeland and thanks to the pro-Jewish attitude taken towards Ancona Jews due to their importance in the trade and banking business, making Ancona a trade center. In 1550, the Jewish population of Ancona numbered about 2700 individuals. The Jews of Ancona received full emancipation in 1848. In 1938, 1177 lived in Ancona. 53 Jews were sent away to Germany, 15 of them survived and returned to the town after World War II. The majority of the Jewish community stayed in town or immigrated due to high ransoms paid to the fascist regime. In 2004, about 200 Jews lived in Ancona. Ancona was one of the most important Italian ports on the Adriatic Sea during the Great War; in 1915, following Italy's entry, the battleship division of the Austro-Hungarian Navy carried out extensive bombardments causing great damage to all installations. The Battle of Ancona was a battle involving Free Polish forces serving as part of the British Army and German forces that took place from 16 June to 18 July 1944 during the Italian campaign in World War II. The battle was the result of an Allied plan to capture the city of Ancona in Italy in order to gain possession of a seaport closer to the fighting so that they could shorten their lines of communication. The Polish 2nd Corps was tasked with capture of the city on 16 June 1944, accomplishing the task a month later on 18 July 1944. The climate of Ancona is humid subtropical (Cfa in the Köppen climate classification) and the city lies on the border between mediterranean and more continental regions. Precipitation is regular throughout the year. Winters are cool (January mean temp. 5 °C or 41 °F), with frequent rain and fog. Lows can reach −10 °C (14 °F) – or below – outside the city centre, during the most intense cold waves. Snow is not unusual with air masses coming from Northern Europe or from the Balkans and Russia, and can be heavy at times, especially in the hills surrounding the city centre. Summers are usually warm and humid (July mean temp. 22.5 °C or 72.5 °F). Highs sometimes reach values around 35 and 40 °C (95 and 104 °F), especially if the wind is blowing from the south or from the west (föhn effect off the Appennine mountains). Thunderstorms are quite common, particularly in August and September (when can be intense with flash floods). Spring and autumn are changeable seasons, but generally mild. Extremes in temperature have been −15.4 °C (4.3 °F) (in 1967) and 40.8 °C (105.4 °F) (in 1968) / 40.5 °C (104.9 °F) (in 1983). In 2007, there were 101,480 people residing in Ancona (the greater area has a population more than four times its size), located in the province of Ancona, Marche, of whom 47.6% were male and 52.4% were female. Minors (children ages 18 and younger) totalled 15.54 percent of the population compared to pensioners who number 24.06 percent. This compares with the Italian average of 18.06 percent (minors) and 19.94 percent (pensioners). The average age of Ancona resident is 48 compared to the Italian average of 42. In the five years between 2002 and 2007, the population of Ancona grew by 1.48 percent, while Italy as a whole grew by 3.56 percent. The current birth rate of Ancona is 8.14 births per 1,000 inhabitants compared to the Italian average of 9.45 births. As of 2006, 92.77% of the population was Italian. The largest immigrant group came from other European nations (particularly those from Albania, Romania and Ukraine): 3.14%, followed by the Americas: 0.93%, East Asia: 0.83%, and North Africa: 0.80%. The marble Arch of Trajan, 18 m high, erected in 114/115 as an entrance to the causeway atop the harbour wall in honour of the emperor who had made the harbour, is one of the finest Roman monuments in the Marche. Most of its original bronze enrichments have disappeared. It stands on a high podium approached by a wide flight of steps. The archway, only 3 m wide, is flanked by pairs of fluted Corinthian columns on pedestals. An attic bears inscriptions. The format is that of the Arch of Titus in Rome, but made taller, so that the bronze figures surmounting it, of Trajan, his wife Plotina and sister Marciana, would figure as a landmark for ships approaching Rome's greatest Adriatic port. The church of Santa Maria della Piazza, with an elaborate arcaded façade (1210). The Palazzo del Comune (or Palazzo degli Anziani – Elders palace), built in 1250, with lofty arched substructures at the back, was the work of Margaritone d'Arezzo, and has been restored twice. Church of Sant'Agostino, built by the Augustinians in 1341 as Santa Maria del Popolo, and enlarged by Luigi Vanvitelli in the 18th century and turned into a palace after 1860. It has maintained the Gothic portal by Giorgio da Sebenico, with statues portraying St. Monica, St. Nicola da Tolentino, St. Simplicianus and Blessed Agostino Trionfi. The Ancona railway station is the main railway station of the city and is served by regional and long distance trains. The other stations are Ancona Marittima, Ancona Torrette, Ancona Stadio, Palombina and Varano. Nuovo Trasporto Viaggiatori plans to run services between Milan and Ancona starting in summer 2013.